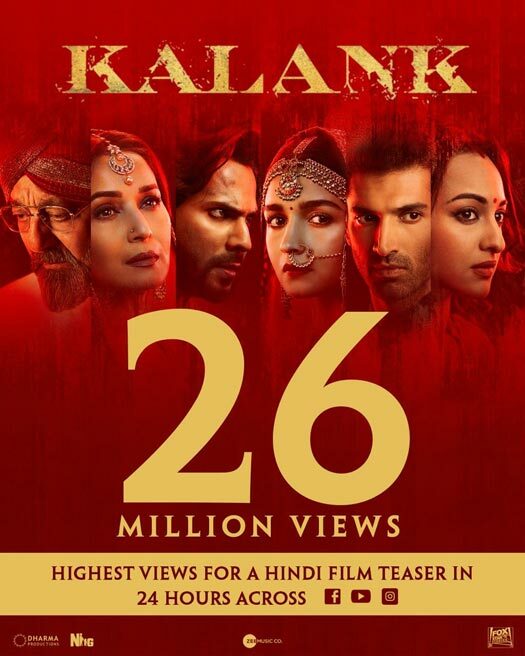 The teaser of Karan Johar’s much-anticipated love saga Kalank, featuring an ensemble cast of Sanjay Dutt, Madhuri Dixit, Varun Dhawan, Alia Bhatt, Aditya Roy Kapur and Sonakshi Sinha was launched on Tuesday has garnered record 26 million views in 24 hours across social media platforms ( YouTube, Facebook and Instagram). The two-minute video features the entire cast of the film which takes you in the era of 1940s set up. The teaser builds intrigue around the plot of the film. Kalank Teaser: With 26 Million Views, It Becomes The Highest Viewed Teaser Within 24 HoursFilmmaker Karan Johar says the fate of*Kalank*will be beyond commerce for him since it is a project that was his “father’s dream”. The multi-starrer film*Kalank*will release on April 17. Manoj Bajpayee BLASTS Commercial Awards Over Gali Guleiyan’s No-Show In Nominations! Fox Star Studios presents Kalank, A dharma productions and Nadiadwala Grandson Entertainment, Directed by Abhishek Varman. Produced by Karan Johar, Sajid Nadiadwala, Hiroo Yash Johar and Apoorva Mehta, and co-produced by Fox star studios. The post Kalank Teaser: With 26 Million Views, It Becomes The Highest Viewed Teaser Within 24 Hours appeared first on Koimoi.